Mary Pickford and Frances Marion helped build the foundation of the movie industry, or Hollywood, as referred to today. 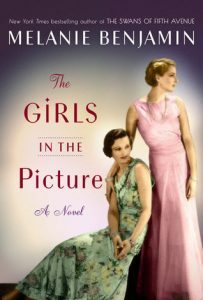 Melanie Benjamin explores their friendship and intertwining careers in this lush historical fiction, speculating on each women’s hidden agenda, demonstrating their jealousies and joys. Mary Pickford was the darling of silent movies and Frances Marion a lauded screenwriter of the era, navigating a perilous pathway through a man’s world. By alternating viewpoints of these icons, Benjamin has provided insight into their characters and woven a wonderfully complex vision of their complicated friendship. Pickford feels she must maintain her veneer of innocent waif, and Marion carefully balances her relationship with Pickford with the need to advance her own career. As the two evolve away from each other professionally, they remind themselves of obligations bestowed upon them by the other’s influence and talent. Benjamin leads the reader through Mary’s agonizing decision to leave her husband for her “true love,” and along with Frances into the Great War, where she meets her fourth and last husband. There’s a softness to the portrayal of Mary’s descent into alcoholism, and the ending displays the inherent kindness of her lifelong friend. This fictionalized version of the friendship of two of Hollywood’s most influential women offers much more than salacious speculation and name dropping—many famous individuals are mentioned based on their relevance to the story. Rather, it depicts the nuances, unspoken feelings, and misunderstandings of the relationship between two strong, independent women who are very different individuals with a similar goal of making it in an industry run by men. I’m grateful to have received an advanced digital copy of this wonderful story from NetGalley.